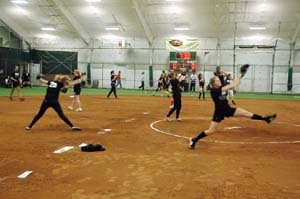 FPN's 10th Annual Winter Individual Indoor College Showcase, Saturday, January, 26, 2019. She has built a staff of her colleagues to work with the players. These coaches have let us know they will be also in attendance. As more let us know we will add them. College Coaches Click Here to E-Mail to Sign up to Attend. Players can be dropped off as early as 7:30-am. Please drop players off. Do not park and accompany your player into the venue unless you are the designated warm-up catcher for your pitcher. You will be directed where to park. PLAYERS DO NOT DRIVE YOURSELVES. THERE WILL BE NO ASSIGNED PARKING FOR PLAYERS. COLLEGE COACHES AND STAFF WILL USE ALL AVAILABLE PARKING. 11:30 - 12:45 Infielders and outfielders drills and stations (players can do both infield and outfield drills). 12:45 - 2:00 All players (pitchers, catchers, infielders and outfielders hit) Hitting is optional. 2:00 - 2:30 Coaches will meet with players in an open forum Q&A. Remember there is no waiting area inside or outside FPN for parents during the showcase. Parents must drop off and and pick players when finished. If a parent is the designated warm-up catcher for a player they will only be allowed in the field area to catch and then they must leave the venue after the warm-up period (8:15-8:45am). You must have all your own equipment (catchers gear, bats, helmets). NO METAL SPIKES. A numbered showcase T-shirt will be provided. You get that at check-in. FPN's elevated grandstand overlooking the field will be exclusively dedicated to coaches only. FPN's elevated views allow coaches to see from above the pitchers and catchers or above the fielders when they are on the field. Coaches will be invited down to the cages during the hitting portion of the event. They may choose to stay in the elevated area. Coaches will be provided a book with the player information from the registration. Pitchers must be prepared to have their own warm-up catcher, In the event pitchers will be paired up with catchers enrolled. If your pitcher or cather is enrolled in the event together and you want us to pair them up just let us know via email. At the conclusion of the event all players will be sent the full list and contact info of all the coaches who attended so you can follow up with an email or and send them any additional info you wish. Once the registration closes there are no refunds. We can credit you to attend the next showcase in some cases. CaptainU will provide online player profiles to increase exposure to college coaches CaptainU will provide player profiles and free access to their online software to help all attending athletes maximize their exposure at the upcoming event to college coaches.